Is Financials Sector Going to Outperform in the UK? The Financials sector was under an uncomfortable heat after the financial crises when governments must have stepped up and implement tight measures on the banks and financial institutions. 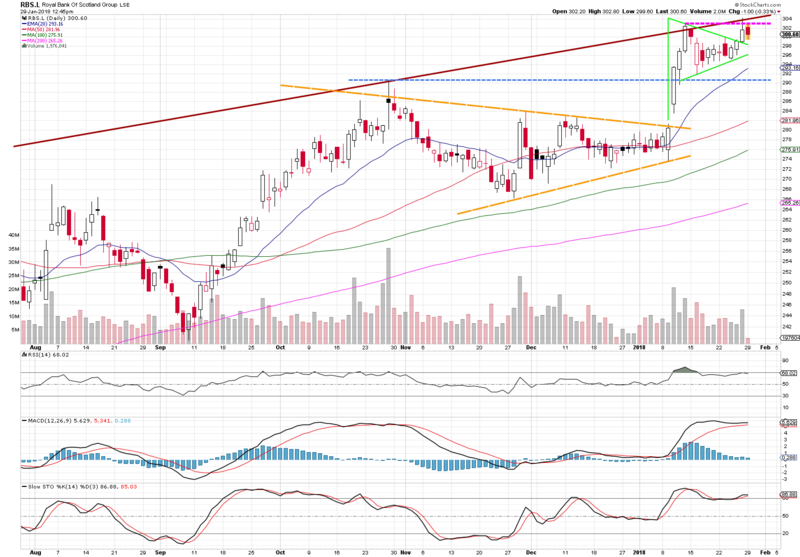 Despite that this sector managed to rise again and form a bullish trend. Unlike in the US, in Europe, the financials took a little break and were traded sideways in the second half of 2017. However, the recent market euphoria kicked off pretty well in the sector and as you can see below, as the new year began a price broke the resistance and recorded decent gain so far. British banks and other financial institutions were slapped even more as Brexit emerged and so the stocks that became unpopular for traders, share prices were moving in untrendy behavior with not much trading appetite at all. These days the Brexit talks are on a different level (politicians actually progress with their politics and negotiations) and banks managed to strategically move staff around Europe to keep their exposure in the local markets. The US started to lift the interest rates while planning to do 3 more hikes in 2018, which allows banks to charge more on their loans and thus also increase their profits. Whether Bank of England will reprise the hikes is uncertain, however very likely when looking at the macroeconomics at the moment. Consequently, these signs indicate a good financials sector’s performance this year. We are going to have a look at three well known high street banks, which give three different chart setups, although all going possibly same direction – UP! After Brexit, a bank has established a bullish channel drawing interesting positions for trading. Wide red lines represent outer trend lines, orange lines represent the inner trend lines and the blue dashed line is the recent support line. As it is obvious that RBS is trending modestly upwards, it has also just broken out from the triangle pattern depicted by orange inner trend lines. 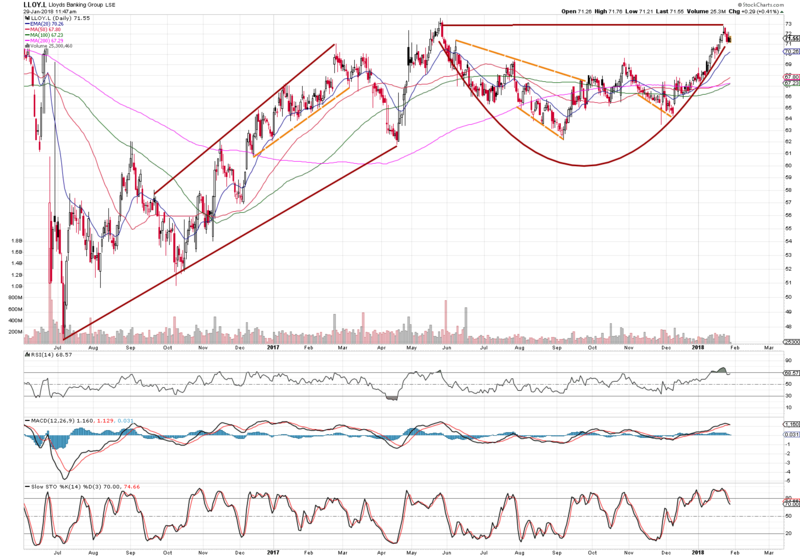 A closer look shows that RBS has recently formed a Flag (Pennant) pattern, which is a bullish pattern providing investors a possible buy signal. This is depicted by green lines, where the pink dashed line serves as a level that needs to be watched. 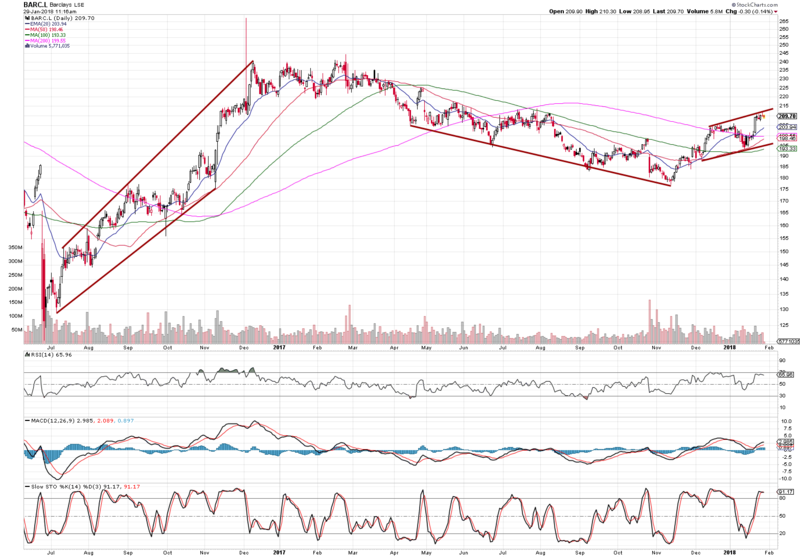 Once the price stays above the pink line, it is time to go long. 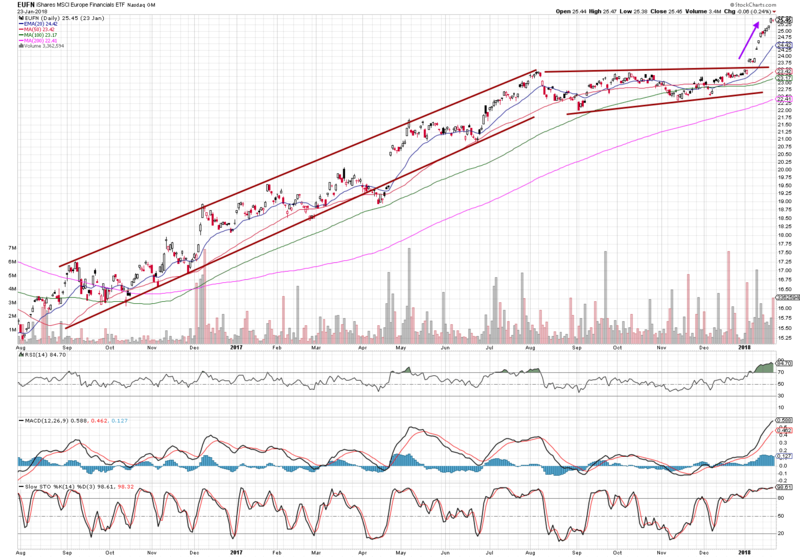 The current support line is the horizontal blue dashed line. While Barclays also managed to regain its value after Brexit, in 2017 the banks took rather a bearish path bouncing from 100 Moving Average that represented its resistance level. Early in December 2017, the banks managed to crash the resistance and it seems like it is building a new trend channel. In short-term the price started to slide on inner trend line (orange dashed line), it’s next support is horizontal blue dashed line. 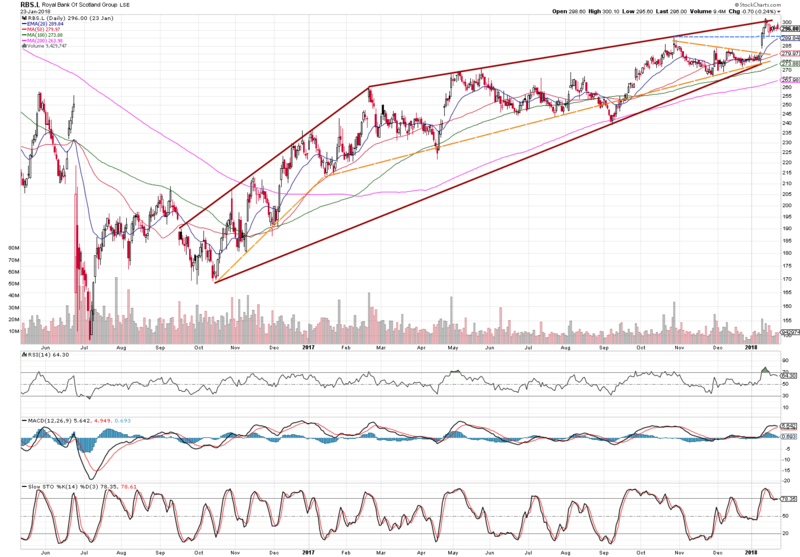 A close prize above the outer red trend line might mean significant further gains for the stock. While Lloyds behaved quite untrendy last year, the recent move to its previous high in May last year has drawn a possible Cup & Handle pattern. Now we just need to wait whether the handle is formed. Once the price rises to 73 level, it is signal to go long.